The simple, plug & play, effective indoor garden that fits your lifestyle. Have fruits and vegetables at your fingertips all year round! Join the Community for updates on our Kickstarter campaign and to claim early bird deals and pre-order information! We promise we won't spam your inbox, and you'll only receive useful, relevant information. 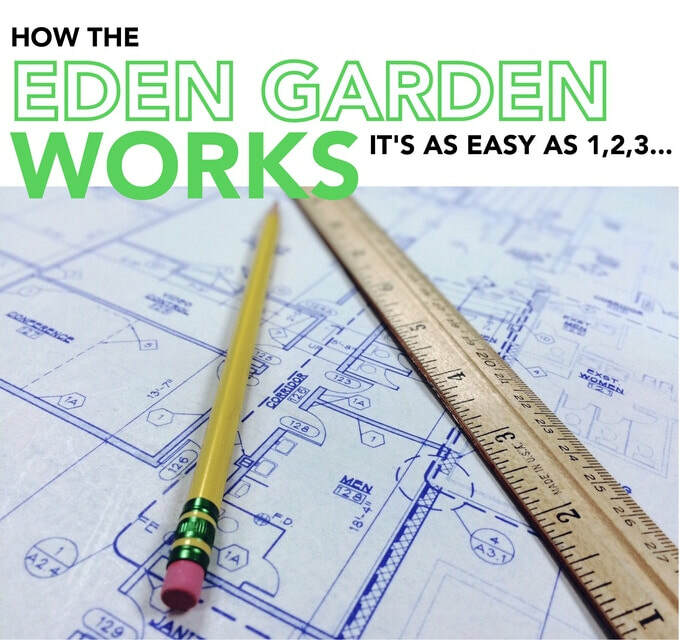 Learn about our Eden Garden Kit, how it works, and what you can do to help bring this amazing product to fruition. Get ready for an indoor garden that fits your lifestyle. Never has it been so easy to have fresh homegrown fruits and vegetables at your fingertips year-round. Eden Garden revolutionizes the way food is grown indoors! The cutting-edge cup design allows you to plant any seeds from anywhere. You can grow lettuce, peppers, beans, tomatoes, cucumber and much more. This indoor garden allows you to grow fresh food year round, 40% more efficiently than soil. Giving you the farm-to-plate experience without leaving the kitchen. Dress up any room in your home with a cutting-edge indoor garden that is not only affordable but makes you money. The proof is in the plants. Eden is a hydroponic indoor garden. The plants are grown directly in water without soil. This technology is being used by NASA in the International Space Station to grow their "space garden". This way of growing uses significantly less space and is up to 40% more efficient than growing in soil. We have analyzed and tested various systems that are available on the market and combined the best of them so you can have a simple, affordable and effective indoor garden. There are many systems on the market, however, that are either very pricey, do not work, or you are stuck buying product from them forever. Our system fixes all of these problems. Our cutting-edge planter removes the need to transplant or cover the seed. It makes it as simple as dropping a seed in and watching it grow. Our lights are the ideal spectrum to grow a variety of foods reliably, allowing your plant to bud and grow until fruiting. A timer is also included to turn off and on automatically, and it gives ideal light cycles. Eden will pay for itself in less than a year, as well as significantly decrease your grocery bills. It is attractive and compact, so you can keep it on display anywhere in your home, even if you're short on room. Most importantly, the Eden Garden gives you freedom! It works with any kind of nutrient you'd like to try and any type of seed. You can grow whatever YOU want, from wherever YOU choose. Use our lights, your own, or natural outdoor sunlight. We give you the tools to grow as simply and universally as possible. You are never "stuck" with our products, though they will work much better than others you purchase. Why Should You Choose the Eden Garden? - Are very expensive, and often range in the thousands of dollars, which doesn't make sense when you're growing a $10 basil plant. You'll never get a return on your investment at those prices. - Are designed to be novelties, instead of real solutions. Seeds often grow to a small plant and never fully mature, because they lack the room or nutrients they need. - Use clever marketing to trick you into thinking they are an all-inclusive, self-sustaining kit. In reality, they are only self-sustaining if you continue to buy the company's expensive product. - Are designed to be compact, but aren't effective. - Was designed specifically to fix the problems in other systems. We paid attention to where those systems fell short, and found ways to improve on them and build something entirely new. - Pays for itself in less than a year. The Eden Garden will significantly decrease your grocery bills. - Is simple in nature, but successfully grows plants to full maturity for real results. - Is attractive and compact, so you can keep it on display almost anywhere in your home, even if you're short on space. Most importantly, the Eden Garden gives you freedom! We want returning customers, but we want you to buy the system for your friends and families because it's great, and it works. We don't want to trick you into buying nutrients and other extra products just so you can use the system. The Eden Garden works with any kind of nutrient you'd like to try, and any type of seed, so you can grow whatever you want, from wherever you choose. You can use our lights, your own, or natural outdoor sunlight. We give you the tools to grow as simply and universally as possible. You are never "stuck" with our products, and they will last much longer than others.